I’ve always loved tales of travel and far off places, adventures under a burning sun, crumbling desert fortresses and high mountain passes. Travellers like William Dalrymple, Bruce Chatwin and Robert Byron have long captured my imagination with tales of Afghan chieftains, nomads in the dessert and forgotten ruins. And they always seem to end up sat on low divans in a tent, or around a fire under the stars tucking into mountains of steaming rice studded with chunks of tender spiced goat or mutton. Their writing is redolent of heady aromas and strong tastes as well as being full of striking descriptions of lands travelled and people met. Which is why this dish is a particular favourite of mine. Yes, it has a long list of ingredients. Yes, it takes a little while to cook. But you know what? It’s totally worth the effort, and it’s really not all that hard to make, even if the ingredient list is long. It’s definitely something that, with a little imagination, you can picture eating around a Persian fire deep in the desert. What this dish does so well is to combine flavours, aromas and textures into a coherent whole. 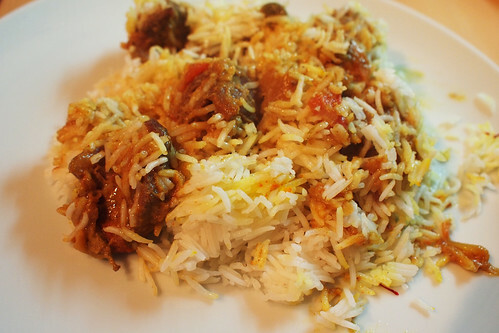 The lamb is tender and meaty and the aromatic, savoury-sweet and intense sauce seeps into the rice, spreading tributaries of yellow flavour throughout the pilaf. And when you dig in, you’re rewarded with all sorts of tasty goodies. It’s a magical experience, and one that can look spectacular as well. This pilaf works brilliantly as the centre piece of a meal. Steam escapes as you plunge your spoon in, bringing with it wonderful smells of food in the bazaar, regal Mughal courts and hawk-eyed mountain tribes. When you bite in, you get a warm melange of spicy flavour, no single one dominating, they combine into a gentle crescendo of flavour. All underpinned by meltingly meaty lamb that falls apart as it hits your tongue. A dish to write home about, and one that inspires in me dreams of distant lands. This comes from Camellia Panjabi’s 50 Great Curries of India, but feels more Central Asian or Persian to me and my fevered imagination. I have modified the spices slightly, mainly because I had run out of fresh ginger. But it is a forgiving dish. I also like to cook the lamb for longer than she says because it comes out even more tender. You could definitely do this with mutton or goat, just cook the meat for longer to makes sure it’s tender. The other thing to try it with would be game – maybe pheasant or even venison for a more regal feel. 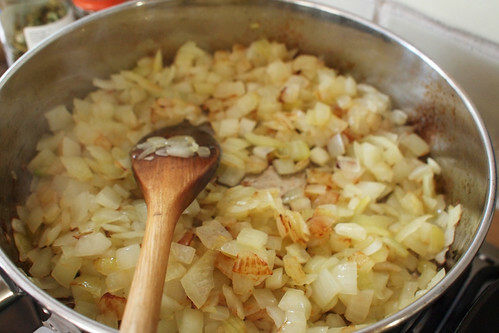 Heat the oil in a large pan over a medium heat add the onion when the oil is hot. Stir-fry until it softens and starts to colour. Add the garlic, chillies, ginger, cloves and cinnamon. Stir for a couple of minutes more then add the lamb and stir some more. Cover and leave for fifteen minutes, until the lamb releases some liquid. Stir every 3-4 minutes. Mix in the ground coriander, turmeric, cumin, cayenne, mace and nutmeg. Add 65ml water and stir it in well. Add the yoghurt one tablespoon at a time, combining each with the sauce well. Add the tomatoes and salt, cover, turn the heat down low and leave to cook for 45 minutes. Stir every fifteen minutes or so to stop it from sticking. While this is cooking start the rice. Measure out the same volume of water as rice. I reckon it to be about 500ml. Bring it to the boil in a large pan and add the rice and bay leaves. When the water has been absorbed, take it off the heat. The rice should be three quarters done. Heat the oven to 160oC. Add the saffron to the milk and leave to steep. Brush some oil over the bottom and sides of a large oven proof container. Put about half the rice in the bottom. 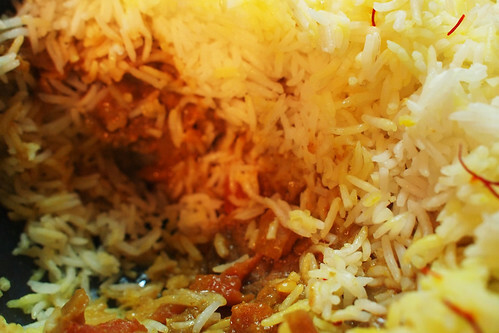 Spoon in the lamb when it is cooked and cover it with the rest of the rice, bay leaves and all. Sprinkle over the saffron, cover and bake for 20 minutes in the oven. Serve, breath in the aromas, sigh and get down to the serious business of eating and dreaming. This looks fantastic I have to say, I remember cooking Pilaf at college and having my eyes opened to a whole new world. Rice cooked like this is amazing and yours looks truly special with that juicy meat as well! Mmm, I can almost smell the fragrant spices from here. Looks like it’s well worth the effort. I’ll have to have a go myself – lamb in Norway is sensational, but mace is pretty hard to come by here so I may have to leave it out. @Nordic Nibbler – I hope they smell good! I’d love to give Norwegian lamb a go, I imagine it is hardy and delicious. Gosh oh gosh but that looks great! I’ll have to put this behind my ear for when some lamb comes my way. some people dream of distant lands… some people dream of London (or not being in Wales), doesn’t help looking at your recipes really. Could you send me some pilaf rice over please ? It’s something I always order in restaurants (and normally disappointed) but rarely cook myself. @Mzungu – Heh, I am usually the opposite! @Shayma – Thanks . Re the milk, I’ve used water before, but thought I would aim for a bit of a creamy edge. Not sure it made much difference though. 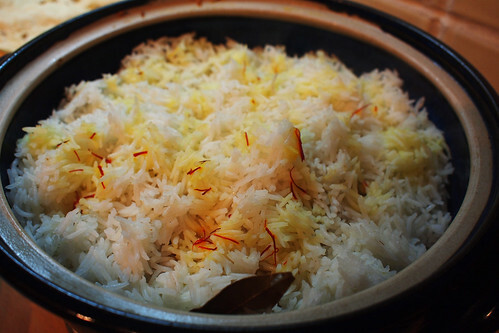 I’ve always been worried about cooking a pilaf / biriyani for fear of stickage. I think I might have to give it a go. @Lizzie – baking it with the lamb juices means that it rarely sticks, it’s more like a stew at the bottom. And so very very tasty.